Teeth whitening is one of the most popular cosmetic dental treatments — and it's easy to see why. Having whiter teeth can make you look years younger, and the procedure itself is among the most conservative (and cost-effective) cosmetic treatments dentistry offers. Sometimes, however, achieving a pleasing, even shade of lightness can be challenging; this is particularly true when a tooth that needs to be lightened has been subjected to an injury (dental trauma) in the past. 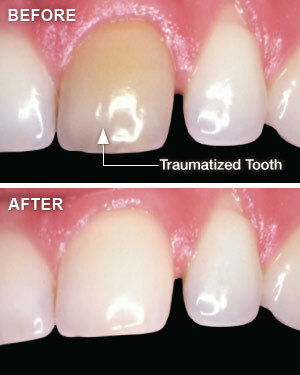 Dental trauma encompasses any damage to the tooth that's caused by an external agent, whether accidental or intended. It may be due to a fall, a sports injury — or even a past orthodontic procedure. According to some studies, around a quarter of Americans aged 6 to 50 years old have experienced some traumatic dental injury, with most occurring before age 19. Traumatized teeth may react to whitening procedures differently from undamaged teeth, which can make them difficult to treat. However, several effective treatments are available. The first step in the process of lightening a traumatized tooth is a thorough exam to find out what's causing the dark staining — and one of the first things we will determine is whether or not the tooth's pulp is “vital,” or alive. This is readily revealed by radiographs (x-rays) or other tests. If the tooth is still vital, external bleaching can often yield satisfactory results — even if it's just one tooth that needs to be whitened. In-office treatments or take-home trays are effective, but office procedures generally take much less time to produce good results. In many cases, however, discoloration of a traumatized tooth is itself an indication that the nerves in the tooth's pulp have died. In this case, before whitening treatment can start, a root canal procedure will be necessary to remove the dead or dying tissue and prevent infection. It can also happen that a tooth that appeared normal will begin to discolor many months (or years) after a root canal has been performed. In either situation, it may be possible to whiten a non-vital tooth with a procedure called internal bleaching. Access to the pulp chamber (the small passageway in the tooth's center) will be gained by making a small hole in the back of the tooth. 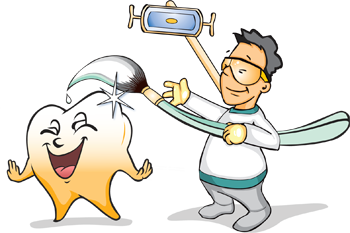 Then, any debris from the chamber will be removed and rinsed away, and a special cement will be added to prevent the bleaching agent from leaking into the tooth's roots. Next, some bleaching agent (commonly sodium perborate) will be placed in the empty pulp chamber, and temporarily seal it in. At this point, you can get up and leave the office… which is why this procedure is sometimes called the “walking bleach” technique. However, you'll return in a few days for another round of bleaching; it may take up to four visits to get the degree of lightening you want. When the tooth reaches the desired color change, a more permanent restoration will be placed on the tooth to seal that little hole — usually a tooth-colored filling material of composite resin. Many times, this relatively conservative procedure will give your tooth all the lightening it needs. If it's not enough, the tooth can be bleached externally as well, or you can even consider a veneer or crown. The goal is to recommend the most appropriate cosmetic dental procedure, and get you the best possible results.